Ancient methods of space travel, independent of mechanical conveyances, which can still be used today. Mass media makes a fuss over contemporary, mechanical attempts at space travel, but according to accounts found in India's Vedic literature, space travel is far from a new invention; it has always been possible. If we are to believe such evidence, yogis and higher beings have the capacity to travel freely throughout the cosmos via subtle technologies that are practically unknown to us. 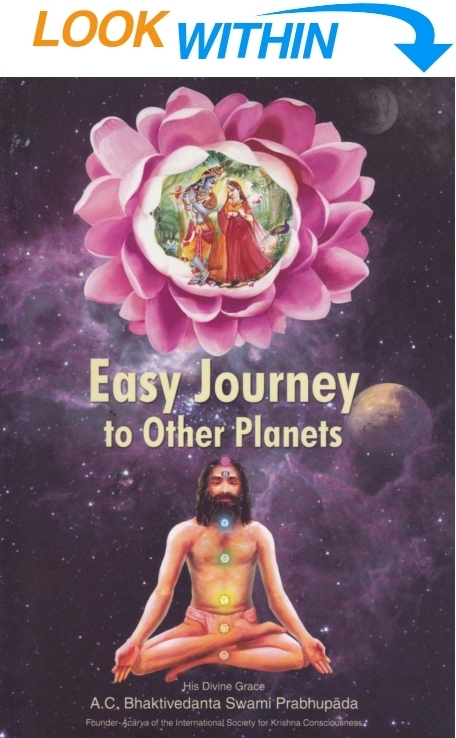 Srila Prabhupada wrote Easy Journey to Other Planets—with its frequent mention of "antimatter" and "antimaterial particles"—as a short treatise in response to the mid-20th century "space race" era, when nations such as the U.S. and U.S.S.R. were obsessed with exploration of the moon, etc. by means of rocket-powered spacecraft. In the book, the author questions the ultimate significance of such endeavors, while pointing out that the exploration of material space is neither a new idea nor the most intelligent one, from the spiritual point of view. One can attempt to go to any planet he desires, but this is only possible by psychological changes in the mind of by yogic powers. Mind is the nucleus of the material body. Anyone who trains the mind to turn from matter to the spiritual form of the Godhead by performance of bhakti-yoga can easily attain the kingdom of God in antimaterial sky. Of this there is no doubt. Matter itself has no creative power. When it is manipulated by the living energy, material things are produced. Matter in its crude form is therefore the latent energy of the Supreme Being. Whenever we think of energy, it is natural that we think of the source of energy. For example, when we think of electrical energy, we simultaneously think of the powerhouse where it is generated. Energy is not self-sufficient. It is under the control of a superior living being. For example, fire is the source of two other energies, namely light and heat. Light and heat have no independent existence outside of fire. Similarly, the inferior and superior energies are derived from a source, which one may call by any name. That source of energy must be a living being with full sense of everything. That supreme living being is the Personality of Godhead, Sri Krishna, or the all-attractive living being. In the Vedas the supreme living being, or the Absolute Truth, is called Bhagavan—the opulent one, the living being who is the fountainhead of all energies. The discovery of the two forms of limited energies by the modern scientists is just the beginning of the progress of science. Now they must go further to discover the source of the two particles or atoms which they term material and antimaterial. The antimaterial world is mentioned here, and in addition information is given that in the antimaterial world there is no “seasonal” fluctuation. Everything there is permanent, blissful, and full of knowledge. But when we speak of it as a “world,” we must remember that it has forms and paraphernalia of various categories beyond our material experiences. The material body is destructible, and as such it is changeable and temporary. So is the material world. But the antimaterial living force is indestructible, and therefore it is permanent. Expert scientists have thus distinguished the different qualities of the material and antimaterial particles as temporary and permanent respectively. The finest form of the antimaterial particle is encaged within the gross and subtle material bodies. Although the material bodies (both gross and subtle) are subject to destruction, the finer, antimaterial particle is eternal. One’s interest, therefore, should be in this eternal principle. The nonmaterial particle, which is the living entity, influences the material particle to work. This living entity is always indestructible. As long as the nonmaterial particle is within the lump of material energy—known by the names of gross and subtle bodies—then the entity is manifest as a living unit. In the continuous clashing between the two particles, the nonmaterial particle is never annihilated. No one can destroy the antimaterial particle at any time—past, present or future. The antimaterial particle, which is the vital force, is never born or created. It exists eternally. It has neither birth dates nor death dates. It is neither repeatedly created nor repeatedly destroyed. It eternally exists, and therefore it is the oldest of the old, and yet it is always fresh and new. Although the material particle is annihilated, the antimaterial particle is never affected. Thus, in the Bhagavad-gita and in all other Vedic literatures the superior energy (antimaterial principle) is accepted as the vital force, or the living spirit. This is also called the jiva. This living principle cannot be generated by any combination of material elements. There are eight material principles which are described as inferior energies, and they are: (1) earth, (2) water, (3) fire, (4) air, (5) ether, (6) mind, (7) intelligence and (8) ego. Apart from these is the living force, or the antimaterial principle, which is described as the superior energy. These are called “energies” because they are wielded and controlled by the supreme living being, the Personality of Godhead (Krishna). For a long time the materialist was limited within the boundary of the eight material principles mentioned above. Now it is encouraging to see that he has a little preliminary information of the antimaterial principle and the antimaterial universe. We hope that with the progress of time the materialist will be able to estimate the value of the antimaterial world, in which there is no trace of material principles. Of course the very word “antimaterial” indicates that the principle is in opposition to all material qualities. There are two worlds—the material and antimaterial. The material world is composed of inferior qualitative energy divided into eight material principles. The antimaterial world is made of superior qualitative energy. Because both the material and antimaterial energies are emanations of the Supreme Transcendence, the Personality of Godhead, it is proper to conclude that I [Lord Krishna] am the ultimate cause of all creations and annihilations. Long, long before the discovery of the principles of antimatter and the antimaterial worlds, the subject was delineated in the pages of Bhagavad-gita. The Gita itself indicates that its philosophy had previously been taught to the presiding deity of the sun, which implies that the principles of the Bhagavad-gita were expounded by the Personality of Godhead long before the Battle of Kurukshetra-at least some 120,000,000 years before. Now modern science has just discovered a fraction of the truths that are available in the Bhagavad-gita. In the material world the topmost planet is called Satyaloka, or Brahmaloka. Beings of the greatest talents live on this planet. The presiding deity of Brahmaloka is Brahma, the first created being of this material world. Brahma is a living being like so many of us, but he is the most talented personality in the material world. He is not so talented that he is in the category of God, but he is in the category of those living entities directly dominated by God. God and the living entities both belong to the antimaterial world. The scientist, therefore, would be rendering service to everyone by researching the constitution of the antimaterial world—how it is administered, how things are shaped there, who are the presiding personalities, and so on. Of the Vedic literatures, Srimad-Bhagavatam deals elaborately with these matters. The Bhagavad-gita is the preliminary study of the Srimad-Bhagavatam. These two important books of knowledge should be thoroughly studied by all men in the scientific world. These books would give many clues to scientific progress and would indicate many new discoveries. The transcendentalists and the materialists are two distinct classes of men. The transcendentalist gathers knowledge from authoritative scriptures like the Vedas. Vedic literature is received from authoritative sources which are in the line of transcendental disciplic succession. This disciplic succession (parampara) is also mentioned in the Bhagavad-gita. Krishna says in the Bhagavad-gita that hundreds of thousands of years ago the Gita was spoken to the presiding deity of the sun, who delivered the knowledge to his son Manu, from whom the present generation of man has descended. Manu, in his turn, delivered this transcendental knowledge to his son King Ikshvaku, who is the forefather of the dynasty in which the Personality of Godhead Sri Rama appeared. This long chain of disciplic succession was broken during the advent period of Lord Krishna (five thousand years ago), and for this reason Krishna restated the Bhagavad-gita to Arjuna, thereby making him the first disciple of this knowledge in this age. The transcendentalist of this age, therefore, is in the disciplic line that starts with Arjuna. Without troubling himself with materialistic research work, the transcendentalist acquires the truths concerning matter and antimatter in the most perfect way (through this disciplic succession) and thereby saves himself much botheration.